Wow, this clock is awesome. It's very cute and stylish at the same time - almost playful. Who says a home must look serious and boring? Not moi! If only I knew who makes this clock. If anyone knows, I will reward you by treating you to my favorite cheese! 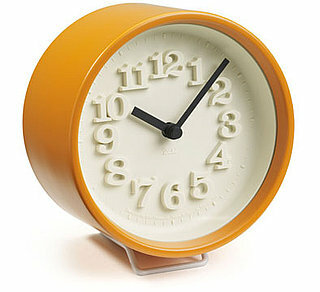 UPDATE: The clock is made by Riki Watanabe and is called the Riki Desk Clock. My cheese offer no longer stands! Ahhh, the suspense is killing me!!! What is your favorite cheese already?!?!? Are you high on life? I am currently high on bubble tea...not sure if that's the same thing?